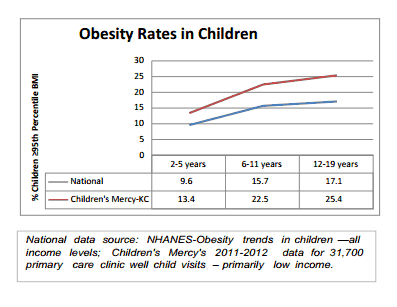 Great news — more of our younger children (less than five years) are at a healthy weight in Missouri and Kansas. Improvements in foods offered by the WIC program and gains in helping more mothers successfully breastfeed likely contribute to this progress. A recent Kansas City survey shows that child care facilities are serving healthy foods and providing an hour or more of play time each day. All of these efforts make a difference for our youngest children. But obesity rates jump when children enter school. Kids’ food and fitness environments have changed drastically over the last 30 years, putting them at higher risk for obesity. 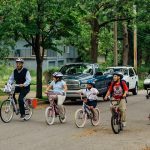 Opportunities to be active have decreased in schools with less PE and recess time, and fewer children walk or bike to school. Older children have an array of high-calorie, low-nutrient foods available through vending, fundraisers, celebrations and athletic events. Schools play a critical role by establishing an environment with policies and practices that support healthy behaviors. Schools also provide opportunities for students to learn and practice healthy eating and physical activity behaviors. School wellness policies are important tools for parents and school districts to prevent and reduce childhood obesity. To find out more about what was going on in the Kansas City area, the Health Care Foundation invested in a school wellness assessment conducted in 2012 by Weighing In, a program of Children’s Mercy, in partnership with KU Medical Center. Current practices to control classroom behaviors, such as restricting recess for children misbehaving or using food as rewards, are prevalent practices. There are healthier alternatives for managing children’s behaviors. Reliance on revenue for selling foods and beverages contributes to excessive calories consumed by students and undermines students’ and families’ ability to maintain healthy weights. High-calorie foods brought for celebrations and fast foods brought for students’ lunch undermines implementation of nutrient standards for school meals. Schools fared well with written policies that 1) addressed written nutrition and PE curriculum and 2) established advisory committees to work on school wellness issues. Encourage staff to be role models for healthy behaviors. Engage families to provide information and /or solicit input to meet district wellness goals. Restrict marketing of unhealthful choices. Implement standards to assure healthy options for foods sold in vending machines, school stores, and a la carte. Implement standards for food served at class parties and other school celebrations. Ensure adequate time to eat. Implement standards for food sold for fundraising at all times (not only during the school day). Provide regular physical activity breaks for students during classroom time, not including PE and recess. Avoid using physical activity restrictions as punishment, such as taking time away from recess. Provide adequate daily recess in elementary school. For more information, the executive summary and full report of the school wellness policy study can be found online: Weighing In-Resources. We welcome any who may want to join our collective efforts. Please drop us a note: weighingin@cmh.edu.